Dragon oversees the construction of a device by Rex Dexter and Mister Glum which they hope will aid in the retrieval of Angel. Jennifer Dragon is angry that her husband trusts a scheming alien and a demonic creature to save her daughter. He defends his actions, causing Jennifer to punch him into a wall before realizing that she has overreacted and apologizes to the battered Dragon. Rex tries to assure the worried mother by detailing his plan. A bracelet that grants its wearer intangibility will be used by Glum to enter into the Vicious Circle’s stronghold to take a hold of Angel and walk out unharmed. The Liberty League then goes to attend a huge gathering of superheroes where Sgt. Marvel delivers a briefing of the plans. They have had undercover agents infiltrate the Vicious Circle and they will be being initiated into the criminal organization later that day at their Gaylord Manor mansion base. Once the moles have visual confirmation of Angel, Vanguard will teleport Glum to that location so that he can walk the child out in an intangible state. Sgt. Marvel then states that a power damper will be deployed that should neutralize the abilities of the villains present while they will be wearing blocking devices to protect them from its effects. There will still be a moderate level of danger due to any cyborgs, alien, hybrids or Gods present but otherwise their numbers should be evened up. Dragon interrupts to question why Sgt. Marvel always wears a gun in a holster but never fires the weapon. Striker explains that it is God’s Gun and that it can grant three wishes, two of which have already been used up. This revelation causes Dragon to request that the God Gun be utilized, bringing Angel out unharmed without anyone’s life being put at risk. Sgt. Marvel is confident that they can accomplish this goal without his weapon and he regrets having used the gun twice already. He killed a one-time friend for murdering the woman he loved before then resurrecting her. Sgt. Marvel feels guilty about using the God Gun for selfish reasons and found it tough not to resurrect his daughter recently. Dragon realizes that Sgt. 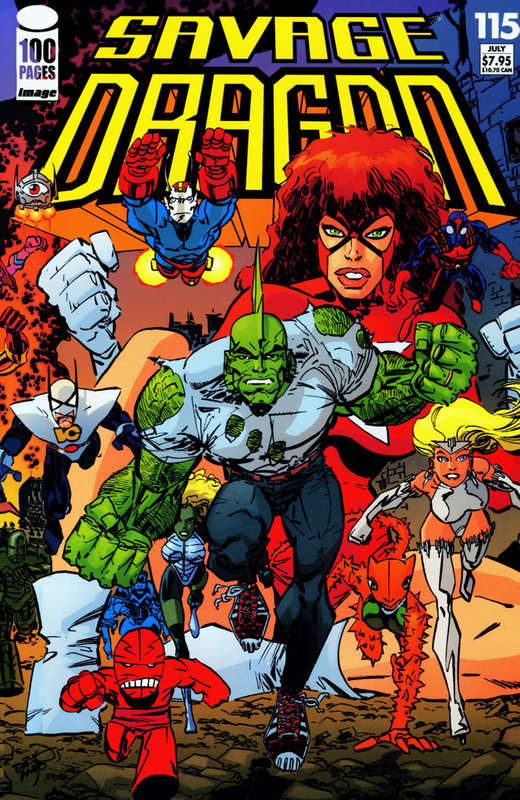 Marvel is Dart’s father but he kept that fact secret from even her. Rock looks around at the assemblage of heroes and does not believe that he and his family belong amongst them. He wishes that the Shrew had not killed one of the Vicious Circle and considers that possibly it would have been smarter simply to have given them some money. Widow is distressed by his words as she does not like seeing her husband acting like a defeatist. Dragon interrupts Kill-Cat as he fails with his latest attempts to pick up Liberty and offers up an apology to her. He wants to clear the air over him killing her son but it soon becomes clear that she has no memory of Damien DarkLord. Her son likely erased her memories of him before his death so Dragon makes his excuses and departs. Liberty & Justice are confused by the whole event but write if off as Dragon being confused by the different realities he has lived in. After having accused Alex Wilde of trying to steal her husband, Jennifer Dragon apologizes to her teammate for overreacting to witnessing her kissing Dragon. She realizes that Alex was simply trying to save Dragon’s life and feels bad for shouting at her. Alex replies by declaring that she had been kissing Dragon in addition to saving him. She also states that if Jennifer ever hurts or leaves Dragon then she will be there to claim him for her own as she still loves Dragon. When visual confirmation comes through for finding Angel, Glum is teleported down but Vanguard contacts the heroes to inform them that there has been a complication. The heroes launch their assault upon Gaylord Manor where Blue Broad had grabbed a hold of Angel as she was turned intangible, making her immaterial too. Glum leads them through a pillar before letting go of Angel which causes Blue Broad to be stuck in the pillar, killing her. In the few seconds that she was solid, Angel is struck by a stray blast and is left bleeding. Brute Force hopes to prove their worth a strong performance but Moe Muscle and Major Battle are killed in the opening salvo, leaving Max Damage to flee for his life. Baby Killer punches a hole straight through Liberty & Justice before turning his attention towards their father. SuperPatriot is left devastated by his children’s deaths and attacks but his foe proves to be invulnerable. The Shrew leaps through the crowd but is shot in the head, horrifying his closest friends. Star suffers broken bones as Red Giant is swarmed over by villains. Jennifer tries to convince Sgt. Marvel to fire the God Gun before the heroes are completely annihilated. They struggle over the weapon which is knocked loose before Sgt. Marvel is shot dead from afar. Dragon is attacked by SkullFace who is revealed as the Vicious Circle’s new leader and he has undergone a power augmentation. He brutally beats Dragon and shrugs off Battle Tank’s attempts to save him. Rex notes that the power damper does not seem to be working which has left the heroes vastly outnumbered by dozens of villains. HotWire and WildStar locate a jamming device that is blocking the damper. They are both shot dead before they can mess with the machine but HotWire’s last act is to deactivate the mechanism, leaving the Vicious Circle almost entirely powerless. A wealthy businessman named August De Blieck Jr. finishes reading Dragon’s autobiography and has been left utterly amazed by some of the cast of the book. He enthusiastically explains beautiful secretary/girlfriend Bunny how a team of heroes called Freak Force was basically the greatest group of crime-fighters ever. Augie is inspired by the stories of their adventures and hopes to use his money to finance Freak Force, uniting them in this reality. Bunny points out that this cannot be completely done as Dart has recently been killed. In a seedy bar, Alison Summers seeks to locate a man named Slash who had aided Mako in locating and then abducting her aunt. She is soon attacked by the rowdy men in the bar which enables her to re-enact the moment that Dart was born. Alison has adopted her aunt’s costumed identity and she swiftly takes down her assailants. Augie arranges to have lunch with Dragon after contributing money to the Liberty League to aid in their efforts to rebuild the world. 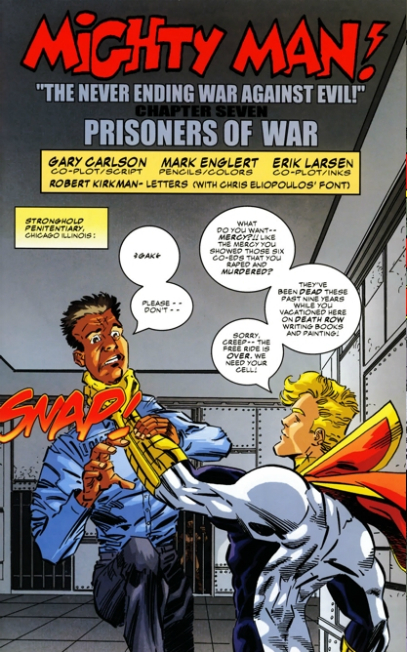 He questions the hero about the members of Freak Force as well as the villains that they faced during their missions. Dragon is not confident that the team can possibly be reformed successfully but this does not deter Augie who begins searching for the heroes. At the set of Barney’s Funtime Playhouse, Marcy Howard ends the production of the latest show before Barbaric and Ricochet are approached by Augie. They have fulltime jobs already but the salary offer from him to join Freak Force is too much for them to turn down. Horridus accepts the position instantly and Rapture is easily paid off. SuperPatriot is not too fond of the idea of joining another team considering how the Liberty League worked out for him but the pay is too good to pass up. Augie uses his money to locate Slash for Dart and turns him over to the authorities on her behalf. Mighty Man delivers RudeHead to the Chicago Police Department before Augie recruits him. 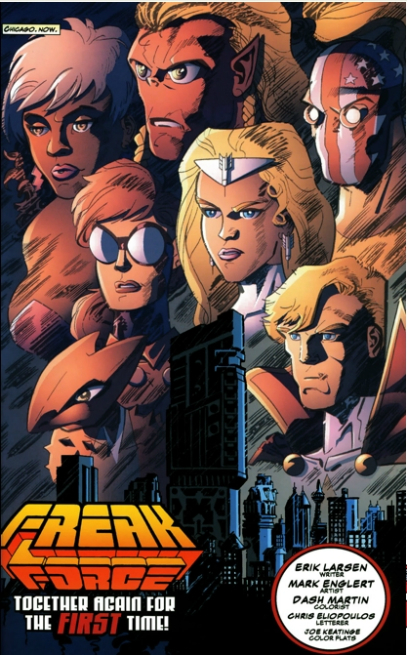 The new Freak Force is sent on their first mission against the Fantastical Force and the Throwaways and it becomes clear that the majority of the heroes are dangerously out of shape. Mighty Man grows frustrated with how the fight is going and decides to deploy lethal force. He then proceeds to brutally kill each of the villains present. The rest of the team are shocked by his actions and Augie is uncomfortable with killing their enemies. When more of the Creator’s minions raid Stronghold Penitentiary, Mighty Man goes against orders and slaughters the villains. The public quickly start to turn against Freak Force after numerous deaths, the destruction of Radiation Island and Rapture exposing herself to criminals. They are lectured in Augie’s skyscraper which suddenly takes on a life of its own. The Inhabiter has finally caught up with Barbaric and Ricochet and attempts to claim revenge upon them. Mighty Man takes the fight right to the Inhabiter and their battle destroys the building, killing Bunny in the process. The rest of Freak Force prove to be ineffective against the Inhabiter who is then flown out into space by Mighty Man and thrown into the sun where he cannot possess anything. Augie surveys the damage and realizes that he is financially ruined. He cannot afford to keep Freak Force together but hopes that they remain together regardless. This hope is quickly dashed as the heroes all quit and return to their own lives. Jennifer Dragon questions why her husband seems to be in pain but Dragon explains that he simply has an itch in the small of his back and cannot reach it. Mister Glum sneaks up on the hero and fires a newly constructed gun at him. Dragon is struck in the back but rather than suffer from the blast he has been left relieved from his itch and even thanks Glum. Dragon thinks nothing of the attack but Jennifer is concerned that Glum really does mean him harm and asks that Dragon speak with him. Dragon goes to talk with Glum who is back in the bedroom that he shares with Angel. 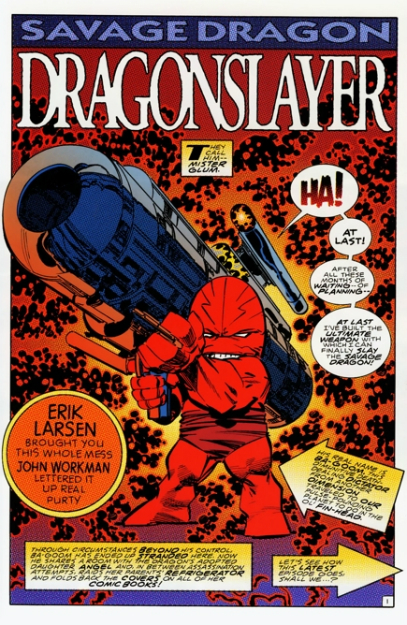 Glum explains that he had grown bored of the conquests on his home world and when he heard of Dragon’s exploits in Dimension-X, he sought to defeat the hero and deliver his bloodied corpse to his people. Angel mocks her friend and ends up tickling him, convincing Dragon that he is indeed harmless.